We have written several times on the topic of paid family leave, not only for new parents but also for workers who need to care for older relatives, family members going through health concerns, and for people who need to handle situations when someone is called to active military service. This week, New York’s Governor Andrew Cuomo is making national headlines for successfully including an employee-funded paid family leave plan for millions of New York workers. Cuomo announced the deal after reaching an agreement this week with NYS lawmakers as they worked on the $156 billion budget for the upcoming year. The deal requires all New York workers to have 70 cents per week taken out of their pay checks but that amount will increase to approximately $1.40 per week. Beginning in 2018, NYS workers who have been employed through their job for six months will be eligible to collect up to 50 percent of their pay, up to 50 percent of the average, statewide weekly wage, for up to 12 weeks to care for a new baby or an ill relative. When fully carried out, which is planned to occur in 2021, workers can receive up to 67 percent of their weekly pay. The benefit is capped at two-thirds of the statewide average weekly pay. 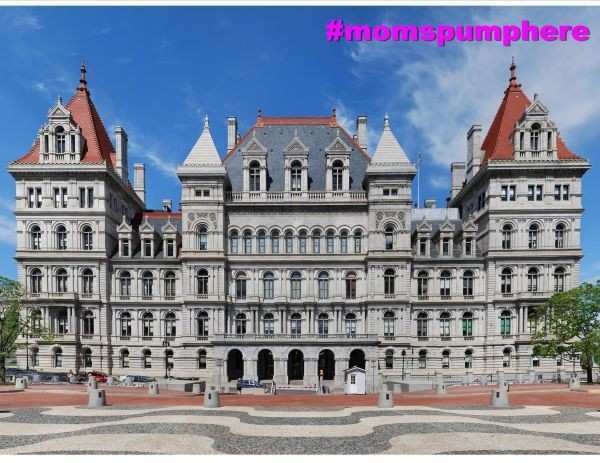 We at Moms Pump Here are proud to be New Yorkers – and we offer a genuine thank you to the legislators and our state officials for making this a priority within the budget deal. Many of our moms will thank you, and their babies will benefit as well as their families and even their employers. Thank you, New York State, for setting the bar high for other states to follow our lead when it comes to Paid Family Leave.